FREE - Write a letter to the President of the United States. 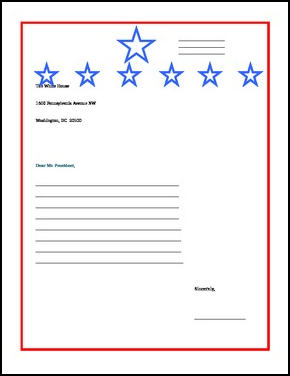 This FREE template goes along with our Election 2012 Powerpoint which can be found on our TPT store - Kennedy's Korner. You can use this template to have your students write to the NEW President and tell him what they think about the current issues that were presented in the powerpoint. You may also use this form letter to have the student's write to the President to ask him a question or address a certain issue or concern your student's might have. Your students may also simply write a letter congratulating the new President after he is inaugurated.